Set in a wild west Mexican world, El Cazador de la Bruja tells the story of Nadie, a feisty, scantily-clad female bounty hunter who is a pro with a pistol. She ends up with more than she bargains for when she pursues Ellis, a timid little girl with a bounty on her head. After discovering that innocent Ellis has no memory of her past, and that she has super telekinetic powers, Nadie takes a sisterly liking to the girl. She gives up her pursuit for the bounty, and the two begin an epic adventure down south to find out the truth about Ellis and her mysterious powers. 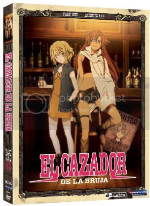 El Cazador is the final entry into the “Girls with Guns” trilogy of anime series from studio Bee Train, right after Noir and Madlax. I have never seen Madlax, but Noir was one of my favorite series when I first got into anime many years ago. With FUNimation releasing both halves of El Cazador (Part 1 and Part 2) on the same day this week, I got a chance to marathon the entire series last weekend. While I was initially disappointed that this wild west incarnation of Noir didn’t live up to the greatness of its predecessor, it eventually won me over as being a great series on its own merits. First, let’s talk about the good parts. Like Noir, the soundtrack to El Cazador is absolutely fantastic. A solid mix of flutes, violins, and female vocals infuse with a spicy Latin beat provides a unique sound that perfectly sets of the mood of this anime spaghetti western. The background music feels almost as essential to this series as its characters and plot. I also really found myself liking the characters and their designs, especially the moé female lead Ellis. Her short blond hair, big blue eyes, and slender body works perfectly with her sweet personality and the naiveté that comes with her case of amnesia. This meagerness clashes quite well with the strong female and male characters that surround her, leading to many interesting relationships and plenty of funny bits. While the series could have benefited with a little more fan service from its female characters, there is certainly a lot here for the fanboys to look forward to. But no matter how much El Cazador feels like Noir, they are most certainly not the same series. The major difference between the two is the attitude and tone. While Noir was a gripping thriller with amazingly intense action sequences, El Cazador is completely loose and comical. This results in very little action sequences, which takes away any excitement or interest within each self contained episode in this “girls with guns” series. By the time things seem to be heating up in the foreground story, the episode is over and you move on to a completely new story in the next one. I also felt a strong disconnect from the female lead, Nadie, and her English voice actress Trina Nishimura. The character appears to be extremely sarcastic and cynical, and the English script surely calls for that by saying catchphrases like, “Yeeeeaaaahhh, not so much.” Yet Nishimura’s performance is very ditzy and happy, which does not match with the sarcastic words that she is saying. But even with these glaring problems becoming immediately noticeable in the beginning of the series, El Cazador eventually redeems itself with its overarching plot centering around Ellis discovering her supernatural powers and mysterious past. This doesn’t really kick in until the third or fourth episode, but by the time you get to the second half of this series, there is enough established to make the series worth watching in the long run. Recurring characters become far more important, and the background of the leads turn out to be far more interesting than the daily adventures they encounter episode-by-episode. The Good: Excellent soundtrack. Likable characters with very appealing character designs. Good overarching backstory. The Bad: Loose and comical attitude takes away from some much needed action in each episode. Poor acting performance from one of the female leads. Final Verdict: El Cazador de la Bruja is a wild west version of Noir. While it is not nearly as good as its predecessor, it is still worth checking out. Watch it. This entry was posted on Monday, December 14th, 2009 at 2:01 pm by Scott	.